GoArmyEd Assistance Center > Topics> Topic: Soldier - How do I use Auto Advisor? STEP 1: Select the “Auto Advisor” Smart Link on your GoArmyEd homepage. STEP 2: The Auto Advisor loading message appears. Select “OK” to proceed. STEP 3: The Auto Advisor Enrollment screen appears. STEP 4: Select the specific term in which you are searching for courses using the “Choose Enrollment Term” drop-down menu. 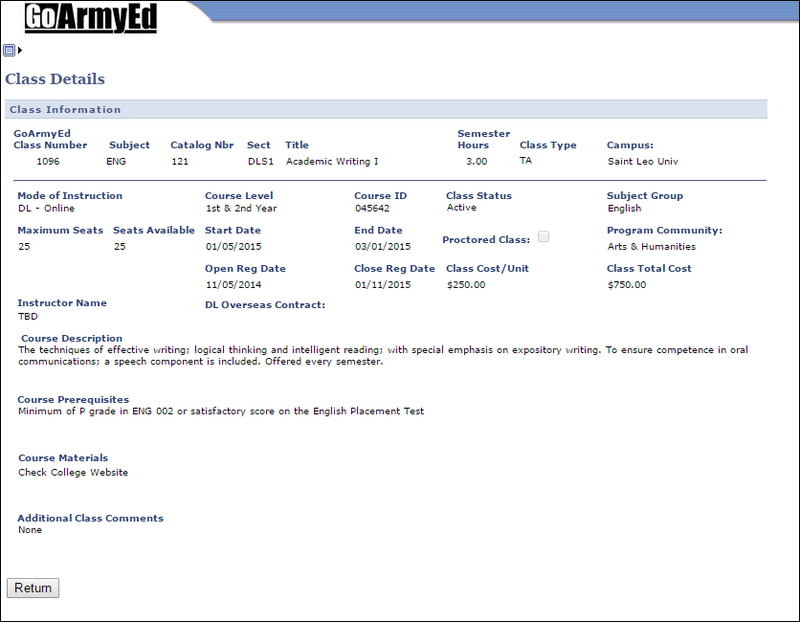 STEP 5: Select the “View Open Classes” link in the View Open Classes column to view open sections of your desired course. 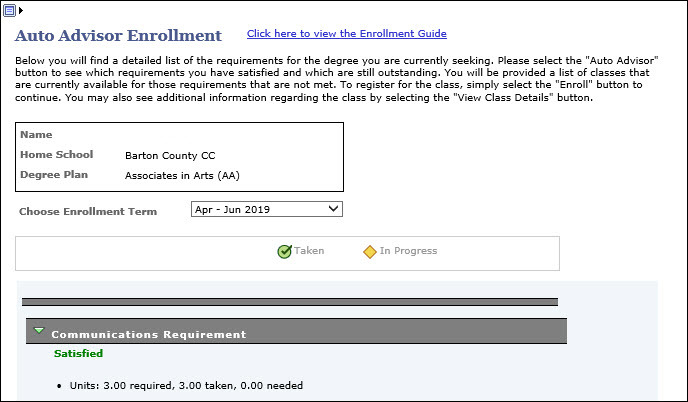 STEP 7: Select the “View Class Details” link for the class in which you want to enroll. STEP 8: The Class Details screen appears for the selected class. Review important class details, including the mode of instruction, start and end date, cost, class description, prerequisites, and more. STEP 9: Select the “Return” button to return to the View Open Classes section. STEP 10: Select the “Enroll” button next to your desired course. STEP 11: A pop-up message appears advising this enrollment is provisional and will be under review to ensure that it conforms to all TA policies and semester hour limits. Select the “OK” button to proceed with your enrollment. STEP 12: A second pop-up message appears advising that funds are subjected to availability. Select the “OK” button to proceed. STEP 13: The Confirm Classes screen appears, and the class you selected appears. Review the class cost information. a) Review the Student Amount and GoArmyEd Amount section. 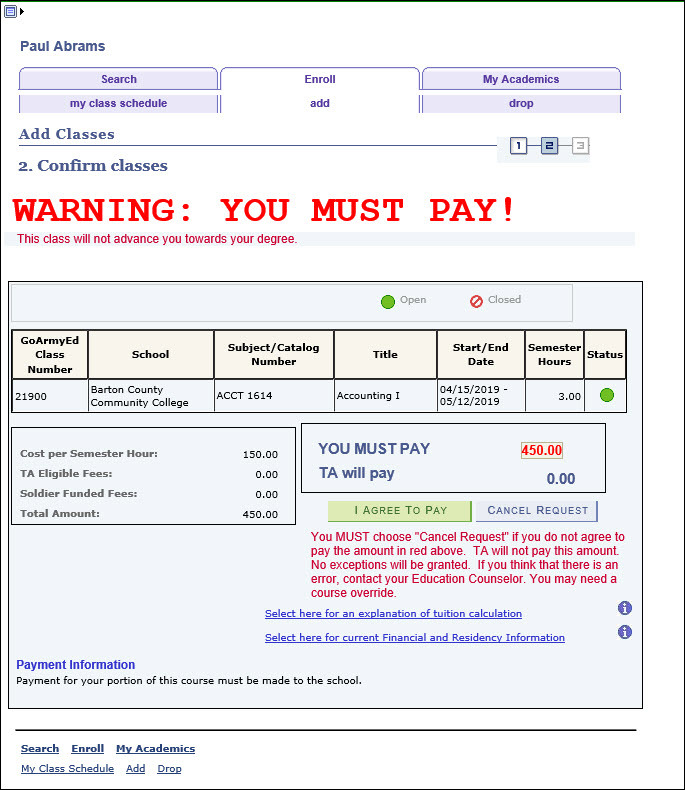 b) If you choose to pay for the entire cost of the class, select the “I chose to Self Pay ALL Costs for this Class” button. IMPORTANT: If you elected to self-pay or there is a student amount, you will receive a “YOU MUST PAY” message with a reason stated. 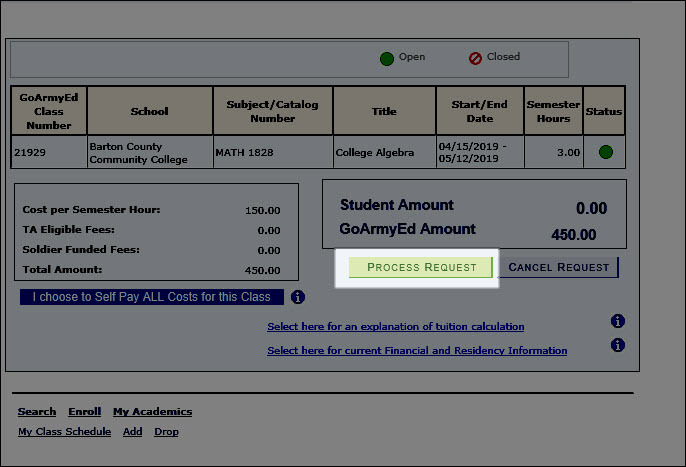 STEP 14: Select the “Process Request” button if you want to continue with the enrollment process using TA. 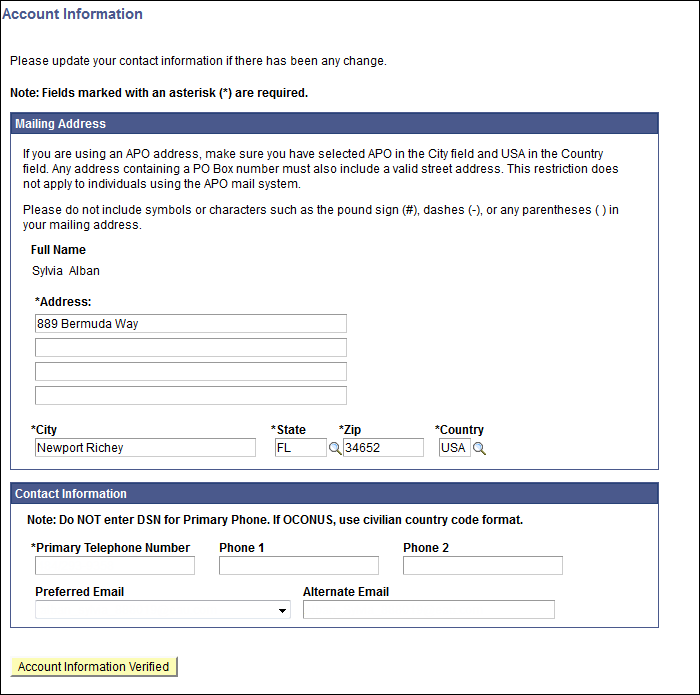 STEP 15: The Account Information screen appears. Review your mailing and contact information. Select the “Account Information Verified” button complete your enrollment. STEP 16: The View Results screen appears. 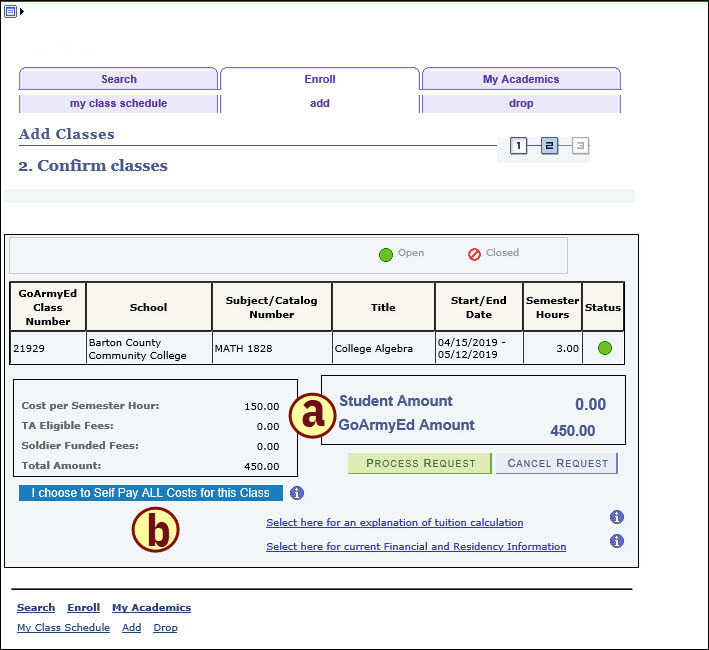 If the message states the class has been added to your schedule, and a green checkmark appears in the status column, your enrollment has been submitted for registration, pending final approval from the school. You will receive an email confirming that the enrollment request is successful. STEP 17: Select the “Close Window” link to return to the homepage.